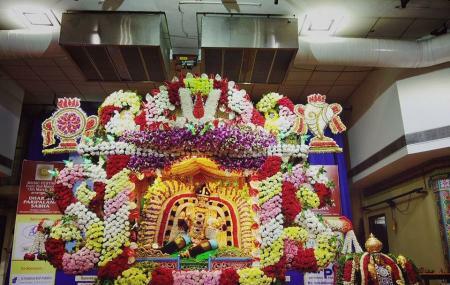 Find hotel near Sri Anantha Padmanabha Sw ..
Set in the Adyar neighbourhood of Chennai, the temple of Anantha Padmanabhaswami a gorgeous Hindu temple dedicated to Lord Vishnu, that will leave your soul satisfied and mind rejuvenated. The temple is a branch of Thiruvananthapuram’s Padmanabhaswamy Temple. The most striking feature of the temple however is the mythological five-headed serpent depicted by the idol of Vishnu here. Constructed on the grounds of land donated by the last Maharajah of Travancore, Chithira Thirunal, in the year 1962, the temple there also has a yagyashala for conducting daily sermons. How popular is Sri Anantha Padmanabha Swamy Temple? People normally also visit Queens Land while planning their trip to Sri Anantha Padmanabha Swamy Temple. Great temple. Well maintained. There is a provision of hall for doing functions and minimum parking facility only. After it is full vehicles should be parked outside on the road. You will experience the Devine power and it's really difficult to explain by words. Those are non tangible one. You have to feel it by own.